It's weird and it's short. Recommended for fans of Killer7, Normality and Pathologic and people who prefer exploration over action. 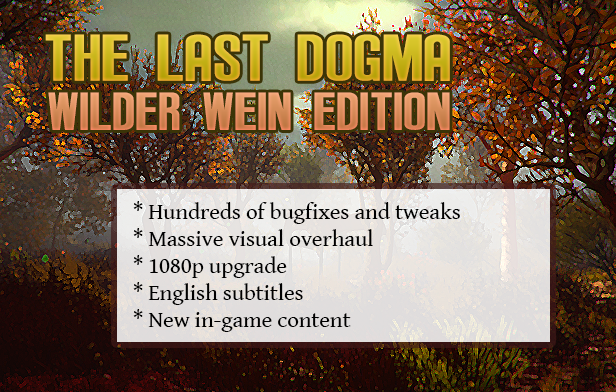 The game is now named "The Last Dogma - Wilder Wein Edition" to reflect many significant updates it got since release. I didn't post any updates in the last months due to lack of feedback, but now it seems there are problems with Chapter Select menu and some new in-game texts, which will be fixed in the next patch. If you found some bug or a typo, please let me know. The game will be on sale tomorrow (80% OFF). Major update of the game is finally finished, it's now available for download on Itch and IGS store pages. The Last Dogma is now on Steam Greenlight for you to vote and also available on IndieGameStand for purchase. Glad to see it's still being worked on. 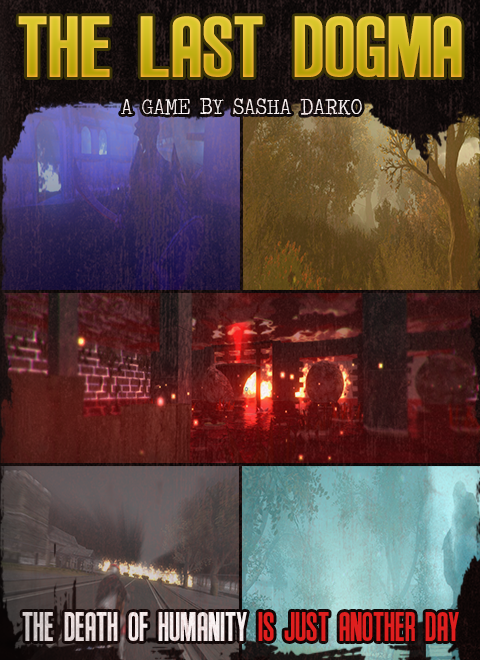 Hey SashaDarko, I recently bought the Limited Greenlight Edition (https://www.moddb.com/games/the-last-dogma/news/limited-greenlight-edition-with-beta-access) of the game, because I want to support your game. However, I didn't get an email up to this date. Is it still in progression or do I have to wait for a certain date? It's not right, you should have three links immediately after the purchase (beta, soundtrack, wallpaper). It seems the system is not working properly. I apologize for this inconvenience. I'll send all links in an hour. That was my comment, I forgot I logged out. I've sent links to PayPal e-mail, check it. Ah great, thanks a lot. Hope you'll get all the funds you need for Steam Greenlight and a whole lot of sales. Keep it up! My name is SDSK and I am a YouTuber. Some of my viewers told me to check out and play a game called The Last Disbeliever. Which you have now renamed to The Last Dogma. I didn't know what to expect but after seeing the previews, screenshots and listening to the really well made OST I am very interested in the game. So I was wondering if the game was in a stable enough build for me to be able to share it with my subscribers. The game looks gorgeous and I would love to help it grow. Thank you for your consideration and good luck on the game. I can tell it is gonna be great. I would love to do a Let's Play of this Alpha! I have a small but swiftly growing channel, and I think that we could both benefit from me playing this Alpha! 1 month (and 1 day) ago I had 250 subscribers. Now I have 540+. Check out my channel if you're interested! look good especially the ambiance created by the music. Keep it up!